For those of you who missed Dr. Christine Noronha's presentation on wireworms last week, you can find her presentation here. While many areas in Nova Scotia thankfully do not report wireworm problems, there are definitely high populations in some fields. Last spring, we set traps in a few fields around the province. 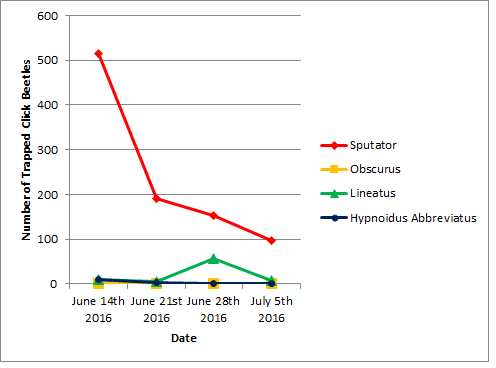 Below is a graph from a vegetable field in Colchester County, showing high numbers of Agriotes sputator, one of the more voracious click beetle (adult wireworm) species. Click beetle flight happens earlier in the warmer parts of the province such as the Valley. Click beetle catch in Colchester County, 2016. Perennia has set out some click beetle pheromone traps again this year, and we just collected our first sample. Below is a photo of our first "haul" from Annapolis County. 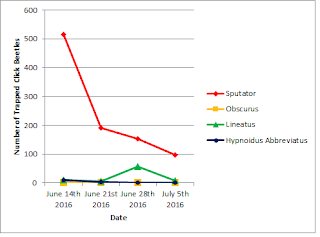 On the left is A. obscurus, the middle is A. sputator, and on the right is A. lineatus. Pheromone traps only attract males, so do not reduce the click beetle/wireworm population, but do give us a good idea of pest levels. May 23, 2017 click beetle catch from Annapolis County.